What is the group & ungroup tool? Trails can be composed of one/several itineraries plus their waypoints (if any). 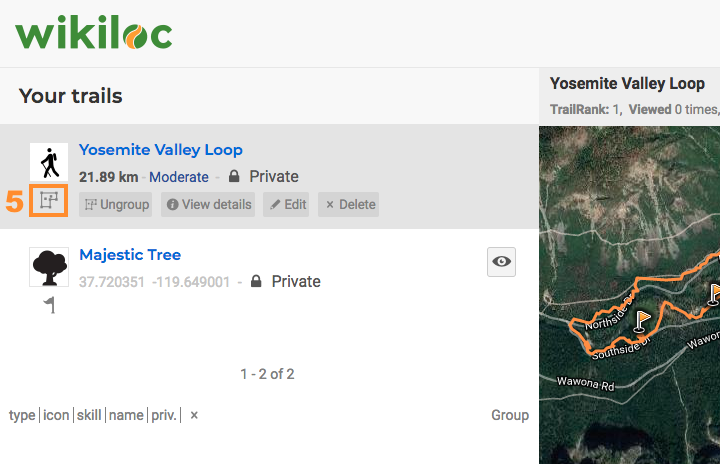 If a route is already grouped, you will see an "Ungroup" option when you put the cursor over the trail name on "your trails" list (top right part of the Wikiloc web, "profile" drop-down menu, click "your trails", list will be appearing on the left side of the screen). While uploading a trail to Wikiloc.com, if it has an itinerary and one/several waypoints, it will break down into: route + waypoints. If you have the waypoint in .gpx file, just upload it to Wikiloc and skip to step 3. Create a trail manually with the trail drawing tool from the Wikiloc Website. Don't bother about the track. You can create an invented short itinerary around the waypoints area, point the waypoints and save the trail without adding further information. Once the route is up, in the "your routes" left list, locate this new itinerary and click on the "ungroup" button (now the itinerary and each of the waypoints will appear separately). Delete the track of that new trail. Group the original track with the original waypoints and the new ones (below we explain how). If they have waypoints, ungroup the trail. Group the different itineraries with all waypoints into a single route. HOW TO USE THE GROUP TOOL? 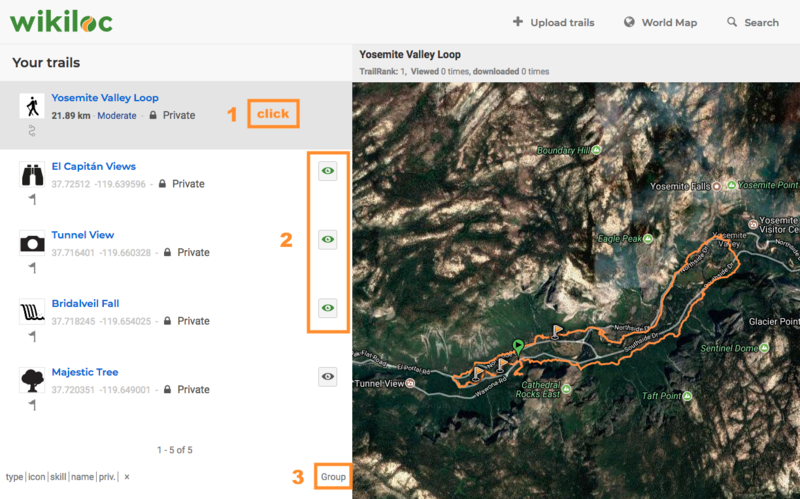 Select the base track (itinerary) that will contain the rest of waypoints/routes by clicking on its name in the left list (ex: click on the name of the track "Yosemite Valley Loop" (1) and it will remain selected). Choose the waypoints/tracks you want to group using the "eye" icon (2). You will see how the eye changes its color and how the itinerary appears on the right map. When you visualize everything you want to group on the map, click on the "group" button of the bottom-right part of the list (3). A new window will open with the names of the selected waypoints/tracks and base track. Review the options and finish the process clicking the "Create Group" button (4).